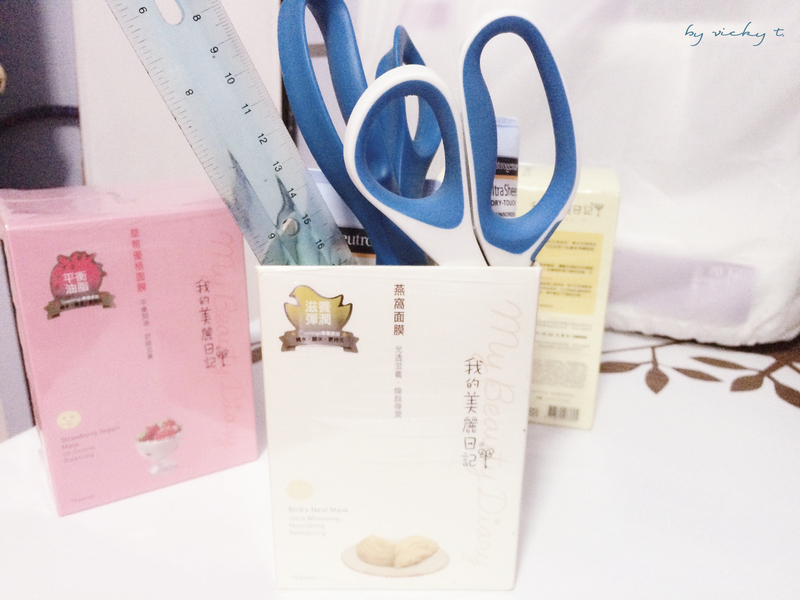 My Beauty Diary is a Taiwanese brand that’s been very popular for years, especially among the younger audience. It’s a very reasonably priced mask; I usually buy them at the 168 market in my area which sells them for $15 each at a buy 2 get 1 free deal. It equates to about $10 a box. There’s 10 individually packed mask in each box. 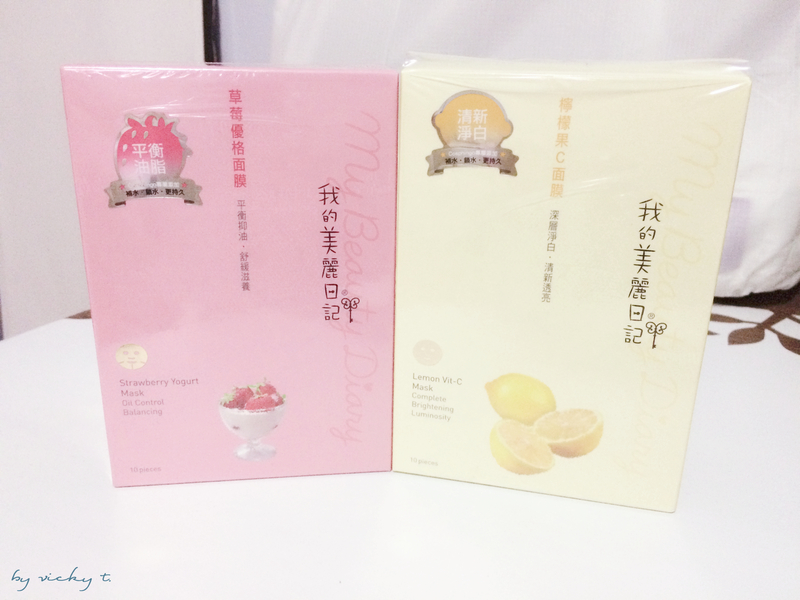 I only have 2 boxes left of these masks: the Lemon Vit-C Mask and The Strawberry Yogurt Mask. The Lemon Vit-C mask is for complete brightening and luminosity and the strawberry one is for oil control and balancing. Truthfully though, I tried various other “flavors” from this series and I can’t tell the difference except the smell is slightly different. On the box, it claims that is uses Cosphingo, which is one of the ingredients to keep your skin hydrated, and it is free of paraben, alcohol, and coloring. It also has a little tip with how you could apply the mask on your face. I find that the shape of the mask is actually a little larger for my face. The eye and nose area fits quite well, although the lip area tends to cover right onto my upper lip. What I like about the My Beauty Diary series of masks is that it’s hydrating. I’ve probably mentioned this quite a lot in my previous post but I have extremely dry skin and though I won’t say this mask works wonders, it does feel great. I tend to use this after I shower with nothing on my face and leave it on for about 20 mins, once a week. After applying the mask, my skin doesn’t feel tight or dry, and I could normally just go to sleep without applying anything else. What I don’t like about the masks is that it tends to be a bit too watery and would drip everywhere as I’m applying the mask. Other than hydrating, I don’t tend to notice the other aspects taking much effect which is why I don’t think the different “flavors” make much of a difference. The DIY of the day: Since I’ve used these masks for quite a few years, I tend to have a lot of these boxes left. I would fold down the lid/cover at the top and tape it all down into the box. Then, I could use the box to store various objects such as scissors, rulers, lotions and sunscreens that I need to use often. I have a few of them around my room to keep different necessities in place. Overall, it’s my favorite mask and I would always come back to it; time to go and do a mask! Did you ever try this series? I love what you did with the empty boxes… clever! Ohh that mask is my favorite too!! 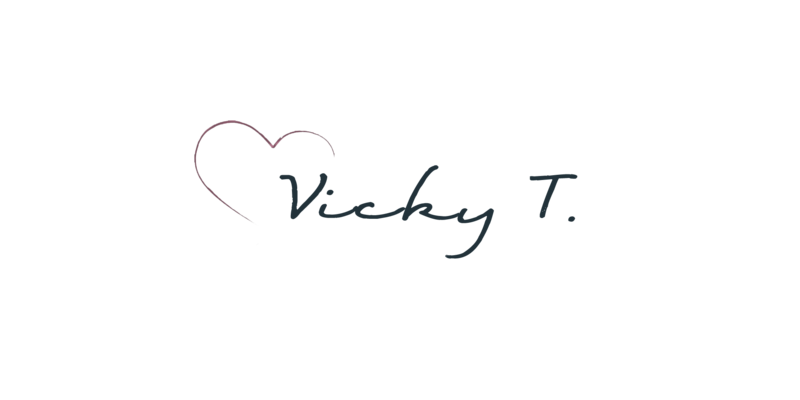 Love your all posts Vicky!! Yes, I did! I love My Beauty Diary Masks! It is a great drugstore brand for paper masks! That’s smart how you reused the box, I really like that! the fact that the products are great and the price is also amazing, definitely gonna try it. great review! 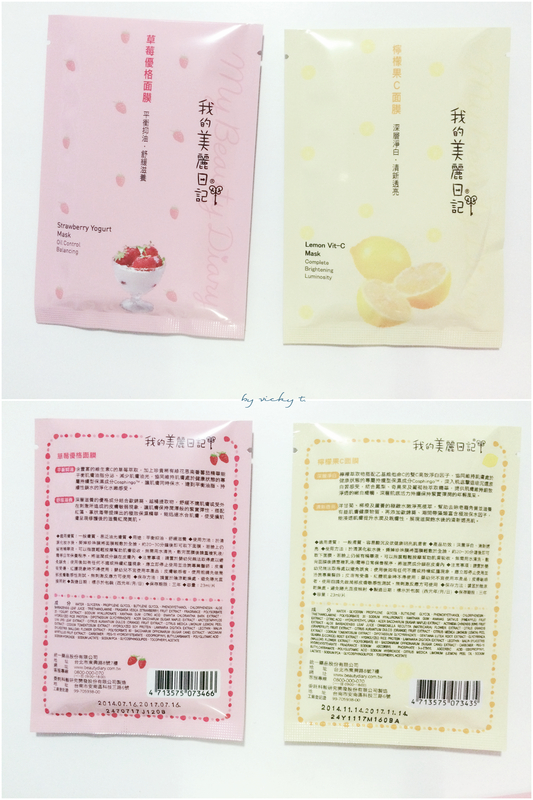 I’ve heard a lot of good things about the My Beauty Diary masks! I love Asian skincare and this is definitely on my list of things to try! 🙂 I like your idea of recycling the boxes, too! I am a skin mask lover, besides having my Korean friend brought 50masks from innisfree last time (LOL), I buy 我的美麗日記 when i ran out of innisfree mask. Oh I never tried the innisfree sheet mask before but I’m thinking about trying some.